This past week, from August 22-26, 2016, the Bioplastics Division of SPI: The Plastics Industry Trade Association hosted its inaugural Bioplastics Week – a social media-based event to increase visibility for bioplastics together with various other partnering organizations, among which European Bioplastics, Plastics Europe, USDA BioPreferred Program, Sustainable Packaging Coalition, and many more. The first Bioplastics Week week closed today with the announcement of the winner of the SPI’s 2016 Innovation in Bioplastics Award. Since 2013, the award has been presented each year to a company selected for its innovative application of bioplastics materials, products or processes. Entries are judged on innovation, sustainability measures and marketplace impact. This year, the award went to Club Coffee, Canada’s largest roaster, contract manufacturer and distributor of packaged coffees. Club Coffee’s PurPod100™ offers consumers a single-serve coffee solution that breaks down fully in typical municipal and industrial composting facilities in as little as five weeks. 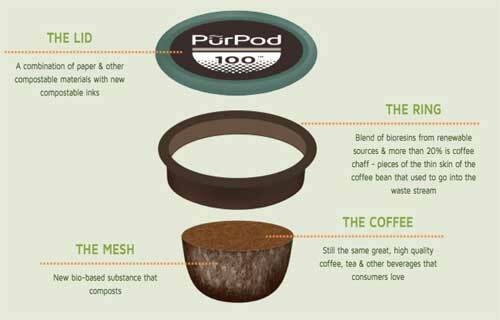 PurPod100 is the first product to earn certification by the Biodegradable Products Institute and its industrial composting abilities were confirmed by tests at composting sites in the U.S. and Canada. Research from the US Composting Council supports PurPod100’s other environmental benefits such as reduced greenhouse gas emissions and the potential to divert tons of waste from landfills to industrial composting. What the Heck Is Up With California’s Recycling Program?